This book provides new and seasoned users with step-by-step procedures on creating and modifying 3D models, working with cameras and lights, assigning materials to objects, rendering, and printing. Unlike many AutoCAD competitors, it uses both metric and imperial units to illustrate the myriad tools for this popular application. Use the companion CD to set up drawing exercises and projects and see all of the book's figures including color. 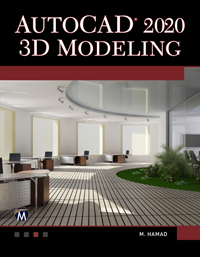 AutoCAD 2020 3DModeling includes 50 "mini-workshops," that complete small projects from concept through actual plotting. Solving all of the workshops will simulate the creation of full projects (architectural and mechanical) from beginning to end, without overlooking any of the basic commands and functions in AutoCAD 2020. Chapter 1: AutoCAD 2020 3D Basics. Chapter 2: Creating Solids. Chapter 3: Creating Meshes. Chapter 4: Creating Surfaces. Chapter 5: Creating Complex Solids & Surfaces. Chapter 6: Solid Editing Commands. Chapter 7: 3D Modifying Commands. Chapter 8: Converting and Sectioning. Chapter 9: Printing in 3D and Creating 3D DWF Files. Chapter 10: Cameras and Lights. Chapter 11: Materials, Rendering, Visual Styles, and Animation. Munir Hamad is an AutoDesk® Approved Instructor, certified AutoDesk AutoCAD Master, who has authored several AutoCAD titles and taught various levels of AutoCAD training.